Recently I talked a bit about my religion and belief structure. Now I'm going to bring something even more controversial to the table: I cover my head. Yup, it's not just reserved for the Judeo-Christian-Islamic faiths anymore. I belong to an online community of pagans who veil, and we all do it for different reasons. Some do it because it's easier than shampooing some days, to cover up dermatological issues, or for religious reasons. What a lot of people don't realise about pagans is that, much like with any other religion, you can't lump us all into the same category and expect us to be cookie-cutter pagans. Some of us dance skyclad under a full moon, and others of us cover our heads. Why do I do it? I do it because I feel called by my deities to do so. I feel that it's the right thing for me to do, as a sign of respect to the deities I pay respect to. I do it to remind me that there's something above, around, and beyond me. I do it to give myself a layer between me and the world, so that on days when I feel extremely shy and afraid of going outside, I can disconnect a little, reminded that I'm safe within the world I create and that my deities are watching out for me. It feels right. That's about the gist of it. And while some people think it's a little strange, I'm comfortable with it. I don't expect everyone else to do it. I don't do it as a sign of submission to anyone. (Even my deities know it's not a sign of submission, but rather a sign of respect and reminder.) I don't do it to be oppressed or oppressive. I'm bad at doing it all the time, but I'm getting better. And so to help me along the way, I think I'll post the occasional picture of myself, in various style coverings. It'll remind me more to do it, even on days when it feels like a little too much trouble to do it all properly. 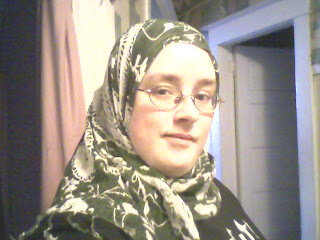 So without further ado, I present myself, with my head covered hijab-style. I find this stle comfortable and protective. Takes a little fiddling sometimes to get it right, more so than just typing a bandana on, but I find the effect is worth it, since I alsolike how it looks.